CubaPlus was happy to host two work experience students from the International School of Havana for a week this January. They shadowed staff on journalistic assignments and spent time with staff from each department, learning about advertising sales and the business side of the publication as well as how CubaPlus produces a magazine in a bilingual work environment. As part of their work experience project, the students were tasked with producing a reportage of their own for publication in the magazine. They chose to write about their school and represent it in photographs. We hope you enjoy their impressive work as much as we enjoyed hosting them for a week. When Ms. Phyllis Powers founded the International School of Havana, she had a plan: to offer an education to foreign students living in Cuba. In 1965, the institution (known as the Hillside School at the time) was not so easy to open, and because the Cuban government still did not recognize it as a school, it certainly was not popular. 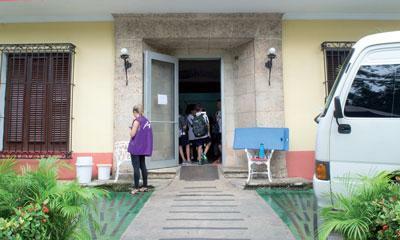 In fact what was a small house on Avenida 39 in Playa (Havana) managed to enrol no more than 10 students that year. However the school kept becoming larger year after year so it had to be moved to another location. This happened in 1974, which was also the year when a group of embassies, the United Nations representation and other foreign entities reached an agreement with the Cuban government to recognize the school as the Foreign Students School. Statutes —which continue to be adhered to— ordered that only students with a non-Cuban passport may enrol at the institution. 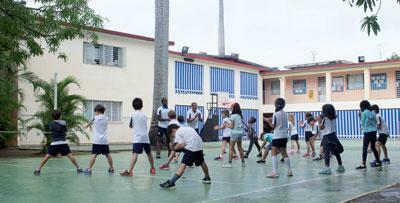 After the school was recognized by the government its community developed and grew so much that it had to move again, this time to the current Main Campus in 5ta Avenida between Calle 16 and 18 in Miramar, Havana. Simultaneously the school finally changed its name to the International School of Havana becoming what it is now. So, what is the International School of Havana? The International School of Havana is now one of the most prominent schools for foreigners in Cuba. It is made up of three campuses: the Early Years Learning Centre, the Main Campus, and the Secondary Campus (which is in construction right now). In the Main Campus, students starting from Kindergarten up to Grade 12 are offered an international education following the school’s academic curriculum. For instance, Pre-IGCSE programs were introduced for middle school students, along with the IGCSE/ICE Diploma for Grades 9 and 10. Furthermore, ISH also offers both the ISH Diploma and the IB Diploma for pre-university students in Grade 11 and 12. When they graduate, most ISH students continue their studies in universities all around the world. Graduates have proceeded to acquire degrees at the Universidad de La Habana, Harvard, Yale, University of British Columbia, Maastricht University, and so on. But do not think that ISH only offers its pupils academics. Countless extracurricular activities make up the students’ lives, filling them with absorbing interests that they can develop throughout the years. Model United Nations is a current student favourite; ISH has been represented at MUN conferences in San Jose (Costa Rica), Vancouver (Canada), Cancun (Mexico), and New York City (United States of America). To follow the school’s mission “Learning to make a difference,” students may even get involved with community service with the aid of the institution. Nonetheless, the International School of Havana not only provides teaching and activities for foreign students, but it also presents itself as an inclusive community for the scholars and their families. Endless activities on and off-campus are an opportunity to unite every person involved with the school. For example, every year, a food fair is hosted to share the different cultures that the students are exposed to every day. It goes without saying, the International School of Havana is more than just a school. It is an educative world of its own, one that builds the minds of its students to learn that being different is wonderful, but making a difference is even better.